Ever wondered how often you should get your mower serviced? Or what’s the best mower to buy? Or who to call when you need a mobile lawn mower repair expert? Well, if you have, Peter Townsend is your man. 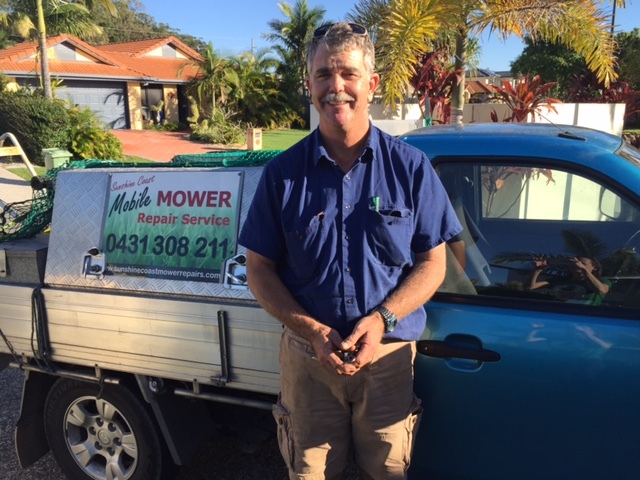 With 18 years under his belt as a professional lawn mowing provider, Peter now happily travels hundreds of kilometres each week to help his Sunshine Coast Mobile Mower Repair Service customers get their lawn mowers fixed. Peter, as an ex-lawn mowing pro, what advice can you give lawn mowing professionals now? Firstly, finding the customer is the hardest part. But if you stick with it, you’ll gradually build up a strong regular customer base via word of mouth, just by the high quality of your work. For me, it took 11 years, but then the next 7 years I didn’t spend a cent on advertising. And secondly, you don’t need to buy a lawn mowing franchise. I started with a franchise but then opted out. What made you switch from mowing contractor to mower repairer? I loved mowing lawns, but after 18 years, my body needed a break. So I moved from Brisbane to the Sunshine Coast and bought my lawnmower repair business here. What’s different about being a repair guy versus a lawn guy? As a lawn mowing contractor, I knew what I was doing from one month to the next because after 18 years, I had built up a solid client base (mainly in south-west Brisbane around Chelmer, Graceville, Sherwood, Mount Ommaney and Kenmore) with regular lawn mows scheduled. In the lawn mower repair business, I never know where the next client will be. We’re based in the Glass House Mountains and mainly service Nambour, Palmwoods, Buderim, Caloundra, Maroochydore, Maroochy River, Bli Bli, Didillibah, Beerburrum, Landsborough, Beerwah, Eumundi, Mapleton, Maleny, Doonan, Yandina and of course, the Glass House Mountains. But in reality we travel to where the work is, which can be anywhere across the Sunshine Coast and the Coastal Hinterland. What are the most common reasons you are called to service or repair lawn mowers? Mower won’t start. Mower blades are bent or worn out. Broken mower belts. Or the mower just needs servicing. Our main customers are people who mow their own lawns with a ride-on mower. They usually have trouble transporting the ride-on to a mower repair shop, so they need a mobile mower repair service to come and fix it at their property, or come and collect it from their property for fixing. Do you also fix mowers for lawn mowing professionals? Not very often, because lawn mowing contractors need their mowers fixed urgently. Lawn mowing guys usually develop a good relationship with their local mower shop so that when they need an urgent fix, their local mower shop guys can look after them. How long is the normal wait to get a mower fixed or serviced? For me, I can usually get a mower fixed or serviced within one week from when someone calls me. For mower shops, residential customers usually wait from 2 to 6 weeks for a regular service (although lawn mowing pros can usually get their mowers fixed urgently). How often should I get my mower serviced? Residential customers should get their mowers serviced once a year. Lawn mowing contractors should get their mower serviced once every 50 hours – because their livelihood depends on it and if their mower breaks down, it’s not just the cost to get it repaired, it’s also the cost of lost time in taking it to and from a mower repair shop (and lost lawn mowing jobs). If I get my mower serviced regularly, how long can it last? If you have a good quality mower and it is serviced regularly, it can last up to 15 years or so. I don’t get many old cheapie mowers coming to me for repairs. They usually just get thrown out and replaced instead. What’s the average price for a ride-on mower service? Usually about $200+GST. But some people charge a lot more than that. We repair Greenfield and Cox mowers, Husqvarna and Honda mowers, Walker and Rover mowers, Murray and MTD mowers, John Deere and Kubota mowers, Toro and Yardman mowers, Cub Cadet and McCulloch mowers, and any other quality brand. How much does it cost to buy a ride-on mower? Bunnings and Masters usually have some from $1,700+. Local mower shops usually start at $3,000. The price can go much higher than this, depending on the make and model. What’s the best lawn mower to buy? Buy the most expensive mower you can afford. And avoid the bottom model of any brand (because those ones are built to a price, not to the specifications that you probably need). What should I look for in a mower? A good brand (and not the base model). And make sure you get the right mower for the right job – not just the mower on special that day. For example, a zero-turn mower is the quickest mower you’ll buy because it can handle tight turns really well, but it is not the best mower for a sloped block – and in fact, it can be quite dangerous. What would be the best mower for a sloped yard then? A Greenfield mower or a Cox mower, because they have a fixed drive (a bit like an “all wheel drive” in a car) that decreases the chances of the mower losing traction on the slopes. These mowers are harder to turn, but because they don’t have the option of a limited dip, the mower should grip better and not topple over as easily, if at all. What lawn mowers would you avoid? I would avoid the cheapies in Bunnings and Masters – they are made to be thrown away after limited use. To me, they’re also like buying a ticket in the lottery, meaning, you could get lucky but most times you won’t. Plus, it’s difficult to get the necessary parts to repair the lawn mowers (and other power equipment like chainsaws and brush cutters) bought from Bunnings and Masters. What mower would you buy if money was no object? A Husqvarna, a John Deere or a Walker – although the Walker mowers are expensive. Or if it’s for a sloped yard, I’d buy a Greenfield or a Cox. What other words of wisdom can you share? Need your ride-on mower repaired? If you live in Peter’s area and you need your ride-on repaired, give Peter a call on 0431-308-211. Thank you very much Peter for agreeing to come and visit us to share your awesome lawn mower advice. We wish you all the very best in your mower repair business on the Sunshine Coast! This interview wants me to go out and buy a Walker, John Deer or a Husqvarna lawn mower. And to think my dad was right all those years saying a victor lawn mower is the only option. Unfortunately, GreenSocks doesn’t do lawn mower repair. I suggest contacting Peter Townsend directly or looking up a mower repair shop in your area. We specialise only getting lawns mowed from expert lawn mowers with their own equipment. Hi Peter, i have 2 broken lawnmowers you might want. I am sure they would be easy to fix and sell or give to someone in need. One starts but leaks fuel. The other is a briggs/stratton that simply had the rip chord break recently so it will work once thats replaced. I have a new one now. Both are free if you or anyone is interested and wants to pick them up from Ashgrove…Let me know. cheers, Mark.